For the last couple of days, I’m digesting materials from the Dreamforce conference organized by Saleforce.com. I wasn’t able to make it this year, but the stream of online information and social networks clearly stated that this even last week in San-Francisco was felt almost like Oracle Open World, which is actually going to happen at the same place in one month. 1. Make full use of public social networking tools like Facebook and Twitter. 2. Create private social networks inside of organizations and among partners. 3. Developing social networking capabilities for enterprise applications. How PLM can get social? In my view, “social” trends are clearly recognized in the PLM space. CAD and PLM vendors started to push some social buzzwords as well make some initial experiments. I can include few tools and announcements made by PLM vendors – Windchill Social Link, Dassault 3DSwYm, SAP StreamWork and few others. This list is not exhaustive. In addition to that, PLM vendors and service provide worked to provide socially oriented solutions based on usage of tools like SharePoint and some others. Social experiments of PLM vendors and huge Benioff Social Enterprise concepts made me think about some elements of PLM that actually can fit into the 3 steps roadmap proposed by a charismatic salesforce.com leader. The focus of PLM software is clearly on the step 3 and related how existing tools used by people in manufacturing company can be connected to social networking infrastructure. PLM tools are doing a lot in collaboration. However, the topic of PLM collaboration for most of the cases is around so called “files” or associated “file data”. The multiple collaborative applications are focusing on how people can access data simultaneously or in an asynchronous way. Here is the main difference. Social enterprise is focusing on people as a major players in social interaction. Files and other data need to be at people disposal in order to communicate efficiently. What is my conclusion? It is still hard to make a prediction about future Social Enterprise development. What is clear to me is that PLM and other systems involved into the overall enterprise social interaction have to find a right way to communicate and expose information to people. Similar to Facebook’s ability to to share files, new generation of CAD, PDM and PLM tools need to build this connection to accomplish the final step in Social Enterprise strategy. Do you think PLM vendors will play Social Enterprise game? A good question. 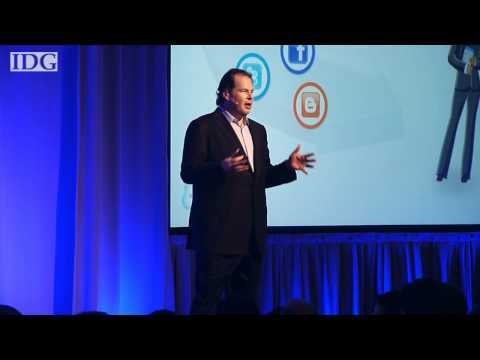 Do you think salesforce.com will become an ultimate social platform? Btw, Salesforce just acquired web domain social.com for $2.6M. Big plans ahead… Just my thoughts.